Jerry Remy ("The RemDawg"), a sports broadcaster since 1988, provides color commentary for all Red Sox games covered by the New England Sports Network (NESN) channel. 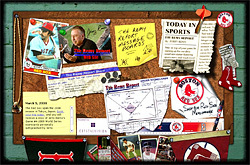 The Remy Report, for most Boston Red Sox fans, is the ultimate source for team related news, information, blogs and chats throughout the American League regular and post season. The Remy Report team wanted to enhance their web presence in order to build visitor traffic, increase membership and partnership, and enhance their credibility as a high-quality business. This required a web development firm that could improve their image and branding - positioning The Remy Report as technologically advanced. Online solutions were also required for automating internal processes, customer surveys and marketing efforts. The creation of custom tools for self-administered sections was required along with ongoing support and continued incorporation of additional features and further enhancements. 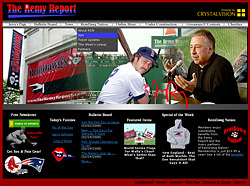 One of the most important factors going into the design of the site was to keep with Jerry Remy's fun and much revered style of "organized chaos." Keeping this in mind, CrystalVision created a "corkboard" splash page using Adobe Flash that balances fun, "organized chaos" and sensible navigation to different sections of the web site. Also featured on the "corkboard" is a "notepad" where the site administrator, via an administrative control panel, can post special messages and link to sections of particular importance. For the home page of The Remy Report's web site, CrystalVision continued the "collage" look of the splash page, bordering it with a top navigation bar featuring drop down menu options and an area managed by the site administrator highlighting special retail items. Here the goal was to have a flexible look to the page that allows for constantly changing content and promotions, highlighting new partnerships such as those forged in 2007 with Major League Baseball and National Football League retailers. Whenever the site is updated with a new poll, photos of "RemDawg Nation" members or special announcements, The Remy Report Team wanted to have a way to announce such changes. That's where the bulletin board section comes in. The content is managed through an administrative control panel and while the most recent ten entries are displayed on the board, older entries can be read on a second page while the five latest entries appear right on the home page of the site. Additionally, the bulletin board features a "Project Amber Alert Ticker" that displays nationwide Amber Alert messages. One of the main attractions for frequent visitors of The Remy Report is "The Lighter Side," a section of the web site devoted to humorous New England sports themed photo collages and artwork by famous cartoonist Larry Johnson and caricaturist Chip O'Brien. At right is the layout for the "Pic of the Day" section. Managed by way of an easy-to-use administration panel, all of the sections include areas highlighting special retail items. 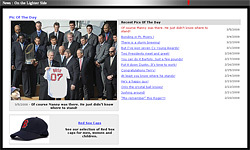 While The Remy Report offers several user interactive features, such as message boards, polls and giveaways, the most popular interactive portion of the site is "This Week's Lineup," a photo area where visitors can upload their Red Sox themed photos along with their names and optional captions. Submissions are reviewed and posted to the web site by the site administrator using a simple preview and publishing interface located in the web site's administration control panel. 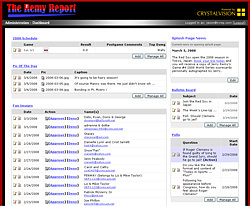 Custom admin tools were developed to allow the Remy Report team to upload photos, videos, and up-to-the-minute news and information. Via the "dashboard," a variety of site contributors have special access to particular sections, enabling them to maintain their areas of responsibility and keep the site up to date. This control panel also allows the site administrator to map out an entire season schedule and upload Jerry's "Take," a brief summary of each and every game throughout the season. In fact, just about every frequently updated section of The Remy Report web site is managed from this user-friendly admin area, making updates a breeze for all those who use it. The Remy Report team has seen a considerable increase in web site traffic and online sales, while long-time fans applauded the site's new, clean look and improved functionality. Over time, CrystalVision continues to develop new and exciting applications for the web site that blend in seamlessly with the existing site's structure and functionality. The improved, professional design of the web site aided new partnerships with many New England-based businesses, as well as retail agreements with Major League Baseball and the National Football League. 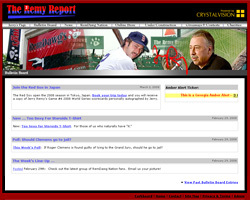 With the web site acting as his primary platform for communicating with Red Sox fans everywhere, Jerry Remy was named the first President of Red Sox nation in November, 2007.